A feeding experiment was conducted to determine the apparent digestibility coefficient of dry matter, protein and energy of six inexpensive feed ingredients viz. ground nut cake, gingili oil cake, sunflower cake, cotton seed cake, rice bran and wheat bran in adult mud crab Scylla tranquebarica (weight 450±17.8g). The apparent digestibility of nutrients in feed ingredients was done using a reference diet with chromic oxide as an inert indicator. Reference diet consisted of fi shmeal, acetes meal, squid meal, soybean meal wheat fl our and binder together constituting 60.15% along with other common ingredients chromic oxide 1.0%, lecithin 0.25%, cholesterol 0.1%, mineral mixture 0.5 %, di-calcium phosphate 2.0%, vitamin mixture 1.5%, fish oil 2.5% and carboxy methyl cellulose 2%. The test diets consisted of 70% reference diet and 30% test ingredient to be tested. The test diets were prepared as dry pellets. The feeding trial with test diets was carried out in a completely randomized design on individually held crabs in oval FRP tanks with a capacity of 100 l with four replicates for each treatment. 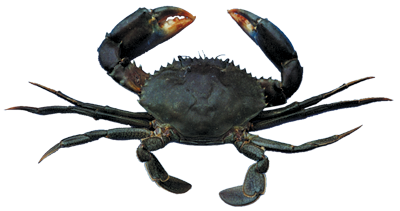 All the crabs were fed with reference diet for 3 weeks and then fed with respective test diets for three weeks. After a week of feeding, faeces samples were collected by siphoning 4-5 hours after feeding. Faeces samples were rinsed with distilled water and stored at -20oC until analysis. The apparent digestibility coefficient (%) of dry matter (ADMD), crude protein (ACPD) and energy (AED) of the test ingredients.